This is my personal story. I´m making it available on the Web because my parents and I want to offer encouragement to other patients and their parents. Also, little is known about hyperinsulinism. There may be a few prospective doctors reading this website, and I hope they, too, will be able to learn something from my story. 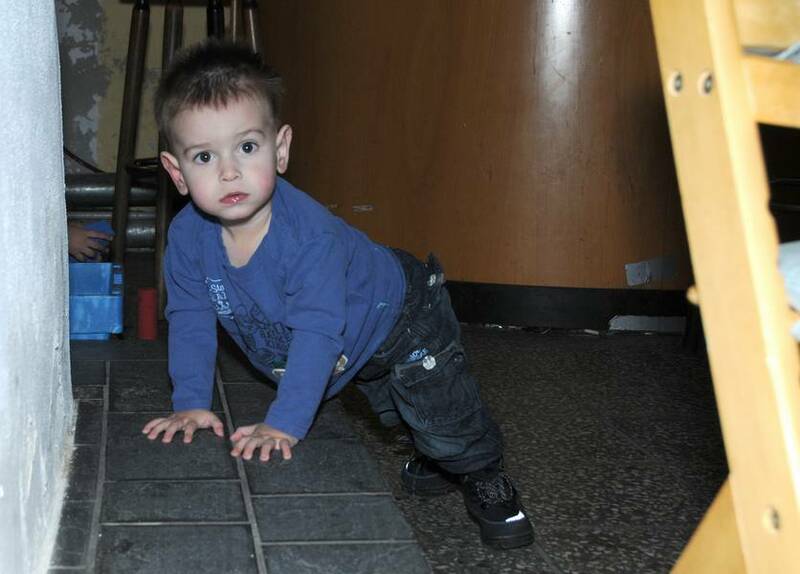 I´m Cian and I was born in Zug (Switzerland) at 11.09 pm on Saturday 27 June 2009. My mother says that her pregnancy proceeded without complications and that I measured 20.1 inches and weighed 7.76 pounds at birth. I was born in the 38th week of pregnancy. The birth went very fast, and I came out in a matter of moments. My father and my sister Yara (born on 26.09.2006) were over the moon when I finally arrived. During the following night my mother slept a lot since she was tired from the rigours of labour and birth. Everyone thought I was sound asleep … until on Sunday morning, around 9 o’clock an attentive maternity nurse briefly took me to the newborn nursery for a check-up; she found me a little too pale. The shock was immediate: my oxygen saturation barely reached 40 per cent and my blood sugar levels barely reached 0.3 mmol/dl. As a first-aid measure, they placed an oxygen mask over my face, and gave me glucose orally. But that didn’t help. 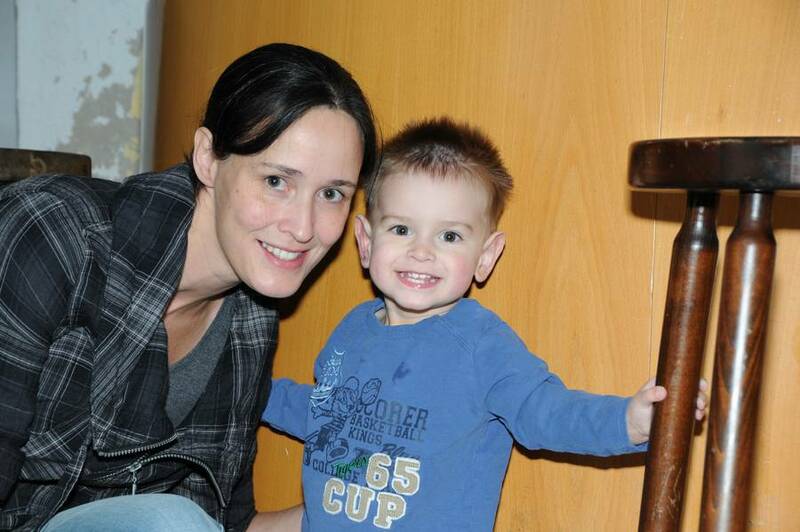 The paediatrician came to see me and called the emergency ambulance at the children’s hospital in Lucern. Professor Thomas Berger came with the ambulance; he put me on a glucose drip and I immediately felt the better for it. Then I had to go to Lucern, where my blood sugar was checked continuously. There I had a unilateral cramp attack, which the doctor put down to my low blood sugar level after birth. My parents first visited me on Sunday afternoon. Incidentally, my blood sugar level of 0.1 mmol/dl was confirmed in the laboratory report. First, my parents were told that I had trouble keeping my blood sugar level within a normal range, but that this would pass after about three days. Unfortunately, this prediction turned out to be wrong. I always needed new glucose infusions, usually after two or three days. I wasn’t happy at all when they set up the drip. Since my blood sugar levels were always critical, they took a lot of blood tests to rule out specific diseases that might account for my symptoms. My parents had to be extremely patient about it all. My dad was angry about the situation, and my mum cried a lot. Daddy and Mummy carried me around in their arms a lot; at least these long hours of kangarooing brought us a little comfort at this difficult time. Mummy used a breast-pump to extract a lot of mother milk and also got me to progress to breast-feeding. I needed to be weighed before and after being fed so that the doctors knew how much I had drunk. After about 10 days Professor Thomas Berger first voiced a suspicion in front of my parents: hyperinsulinism. This diagnosis was confirmed by further tests. My parents went on to google the term. My mother was shocked to learn about the clinical characteristics of the disease and the secondary damage resulting from the low blood sugar levels. Subsequently she avoided doing any internet research on hyperinsulinism since she didn’t want to worry unnecessarily. There are various types of hyperinsulinism, and the course of the disease can vary quite a lot, so my parents wanted to wait and see for themselves how I developed and didn’t want to experience any more confusion and apprehension. I spent 4 weeks at the children’s hospital in Lucern. Then my parents took me to the children’s hospital in Zurich since the doctors there had more experience of the disease. Only one in 50,000 children suffers from hyperinsulinism. Since it is such a rare disease doctors tend to overlook it at first; often, parents are sent home with their seemingly healthy children, where they then suffer hypoglycemia which may cause brain damage and may be life threatening. At the children’s hospital in Zurich Prof. Eugen Schoenle took over my treatment. He tried using diazoxide to control the hyperinsulinism, and the result looked promising at first. But after five days it became clear that despite the use of diazoxide my blood sugar levels were too unstable. So they stopped treating me with diazoxide and tried sandostatine instead (agent octreotide). This helped to stabilize my blood sugar levels. Days later I received my insulin pump, whose reservoir had to be filled with sandostatine. Every other day the catheter was changed from one thigh to another. I didn’t like that at all. My mum had to learn everything and was prepared for my release from the hospital. She was given a huge box with lots of medical accessories: information on the pump, catheters and tubes, insulin syringes (to deliver just one dose of insulin if the pump doesn’t work), a blood glucose analyser and test strips, liquid glucose for emergencies, a Glucagon syringe for the worst-case scenario, etc. She was also provided with an emergency checklist on how to proceed if problems arise and with emergency phone numbers for life-threatening emergencies. On 21 August (a good eight weeks after my birth) I was allowed to go home. I didn’t know that the world could be so varied and colourful and had to get used to my new surroundings, unfamiliar sounds and smells. The time that followed was happy and peaceful. My mother breast-fed me at least every three hours during the day. Before that, of course, she measured my fasting blood sugar and recorded the results in my blood sugar diary. At night she usually gave me the breast every five hours. My sister Yara also found the nursing period very exciting. She often sat next to me with her doll, whose blood sugar she also measured before giving her the breast. In October 2009 I was readmitted to the children’s hospital for a PET/CT and an MRT. My parents were told that I had a focal form of hyperinsulinism and that the focus was located at the head of the pancreas. Since many vital arteries, bile ducts, etc. pass through the pancreas, they were told, it was too risky to surgically remove the focus. My parents were advised to continue treating me with sandostatine. Until my seventh month of life everything went ‘normally’ – considering I had hyperinsulinism and despite the constant measuring of blood sugar levels and the necessary adjustment of feeding times. My mum gave me the breast every three hours, a rhythm that worked quite well until the age of six months. We were able to reduce sandostatin doses (in its concentrated form) from initially 2.0 units to one fifth, i.e. 0.4 doses. We were full of hope that my hyperinsulinism would sort itself out in time. From the seventh month onward the milk changed, it became more watery and of course there was less because of the stress. During this time I became more active and didn’t sleep as much as in the months before. My mum then decided to stop breastfeeding and I got artificial baby milk (Bimbosan, a Swiss product). My doses of sandostatine shot up very quickly to 1.6 units, finally reaching 2.0 units again. The sandostatine had to be kept cool. As soon as it entered the insulin pump, the room temperature (and body warmth) caused bubbles to form. My mum found this quite annoying. When there were air bubbles in the catheter (tube) of the pump, she had to check the tube all the time and let the air escape – a very strenuous process. If I got only air rather than sandostatine, my blood sugar levels were much lower. That’s why Mum took the sandostatine out of the fridge, poured it into the reservoir of the insulin pump and left it for six hours. She then let the first, big air bubble escape by knocking on the pump; then there were hardly any bubbles left. Nevertheless she always checked the reservoir when she changed my nappies and let any air bubbles escape. This made managing the air pump a lot easier. My blood sugar levels were usually somewhat higher in the early and late morning than around midday and in the afternoon. In the evening, at around 4.30 pm, my levels were not so good, and my parents often had to play it by ear when it came to measuring blood sugar. Their motto was: “It is better to measure too often than not often enough.” My parents then came up with the idea of adding a profile to the insuline pump; this allowed them to reduce the doses of sandostatine in the early and late mornings and to increase them towards bedtime. In emergencies (especially in the case of gastro-intestinal infections) Mum massively increased my dose of sandostatin using the insulin pump until we finally reached the clinic by the skin of our teeth, with Mum always keeping the tube with 50 per cent glucose on hand so that she could let the sugar water trickle into my mouth (I often had to vomit because of how sweet it was). The worst thing was the stressful drive to the clinic where I got the life-saving glucose infusion. We could finally breathe a sigh of relief, and wait for the blood sugar levels to return to normal. My parents never noticed any side effects of sandostatine. My mother never read the patient package insert properly. My father did, but he told my mum she didn’t want to know about it. Dad knows her quite well and he is certain that she would have worried not just about the hyperinsulinism but also other side effects (and she would never have got any sleep). I had all my teeth at 18 months (apart from the second row of molars). That’s also the reason why I had so many infections at that time. Summer 2010: we’re struggling. I’m teething, which means I have loose stool and am susceptible to infection (hand, foot and mouth disease). After all these infections and all the stays in hospital my Mum was one of the more critical mothers of a baby patient. She showed full commitment, and questioned or refused to accept illogical decisions by doctors and nurses. She was my first and only advocate at that time. My sister Yara didn’t like mash when she was a baby. And I liked it even less – yuk! As a true ‘milksop’, I lived exclusively on milk until the age of 12 months. That’s why Mum didn’t let herself be dissuaded by the remarks of some doctors when I was eight or nine months old. They wanted to force mash on me or to put semi-solid food into my bottle. Mum flatly refused. I was allowed to eat from the table, or at least try, and was also given my bottle. My mother didn’t enrich my bottle food. After a few trials with appropriate amounts of mondamin she gave up the idea. My blood sugar levels remained more stable for only 15 minutes – if at all. That’s why I was given my bottle every three hours (around 120 to 150 ml). Depending on what and how much I’d eaten my blood sugar levels stayed normal for between 45 minutes to three hours (three hours being a rare occurrence). Then I got some nibbles again or my bottle. I always liked risotto with a lot of cheese in it; this kept my blood sugar stable for a while. Apart from that, I ate a lot of veggies or fruit, which was not ideal for my sugar levels. My weight was always below normal, but I was taller than average. In August 2010 my father went to Alaska for two weeks. Satellite telephony enabled my mum to tell him that it was possible to have the focus at the head of the pancreas surgically removed in Germany. On 8 September 2010 I went for a check-up with Mum in Zurich (blood tests, etc.). That’s when she talked to Professor Eugen Schoenle about the possibility of getting a second opinion from a German doctor concerning an operation. Professor Schoenle referred us to Professor Klaus Mohnike in Magdeburg and assisted us in getting our expenses reimbursed by the Swiss health insurance. 19th Oktober 2010: My whole family travelled with me to Magdeburg, Germany, to get a second opinion from Professor Klaus Mohnike. The L-Dopa-PET/CT scan was carried out by his brother, Professor Wolfgang Mohnike, in his private practice in Berlin. 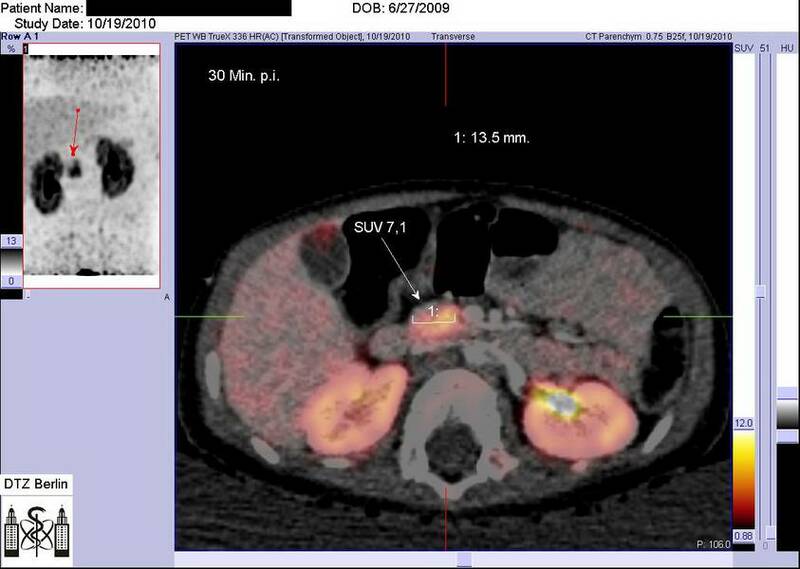 Dr. Ludwig von Rohden, an experienced ultrasound specialist had confirmed the presence of a focus at the head of the pancreas one day before the L-Dopa-PET/CT (using only ultrasound and his trained eye). Dr. Traugott Eberhard took on the important job of analysing the scans. Then Professor Klaus Mohnike conferred with Professor Winfried Barthlen; both of them recommended surgery. At home my parents drew up an endless list of questions on different operative scenarios: chances, risks, complications, secondary damage, etc. The surgeon, Professor Barthlen, had to answer all the questions they had thought of. Tuesday, 16th November 2010: Mum travels with me to the Baltic, to Greifswald, Germany, where Professor Barthlen and his team perform the operation, which is not easy and takes almost 12 hours. The digestive enzymes of the pancreas must be shunted into the intestines using Rouen-Y. But the operation was more than successful: I’M CURED OF HYPERINSULINISM!!! The focus was right at the head of the pancreas. Not an impossible but a difficult and complicated intervention. The operation had to be carried out by transverse abdominal incision to get at the focus. Following the operation I was sedated for four days because my pancreas had been transected and the digestive enzymes had to be shunted into my intestines. My mother will probably never forget the day of the operation. She explored Greifswald and Wieck, got to see the beautiful Baltic Sea and thought of me all the time. The following days were not easy for her, either: she had to sit at my bed waiting. Because of all the water I looked like a Michelin man. Only when the tubus was removed after 4 days did the water drain from me. Of course, I was afraid and suffered some pain – I wanted to get out of bed and into my Mum’s arms. But all she could do was sit at the bedside and comfort me since I couldn’t be moved. That was one of the most difficult periods for her. But she couldn’t help it. Fortunately, the doctors and nurses were very understanding with her and encouraged us. Ten days after the operation I began to cavort around my bed despite the long cut on my tummy from the lower left costal arch to the lower right costal arch. And I kept Mum and the nurses on her feet. Mum told me the other day that I was one of the noisiest patients. Why did my parents travel all the way to Magdeburg and Greifswald with me? They contacted experts by phone, e-mail and in person to find out which doctors and hospitals specialize in hyperinsulinism and enjoy an international reputation! It was the success rate (not the number of operations performed) that mattered to my parents. Besides, my parents know human nature, and my Mum trusted Professor Mohnike and Professor Barthlen right from the start because they were honest with her. The surgeon, Professor Barthlen, knows exactly what he is doing and what may happen if he removes too much tissue from the pancreas – and that is what he wants to avoid at all cost. The reason is that my parents didn’t want me to become a type 3 diabetic. We express our gratitude to Professor Barthlen and his professional team for their commitment and their expertise. We are also indebted to Dr. Müller and Dr. Wildbrett from the surgical ward. It is thanks to their extraordinary teamwork that we can lead a normal family life without any restrictions. I don’t even need follow-up examinations now. Special thanks go to the team of the children’s intensive care unit led by Professor Stenger in Greifswald – many thanks for being so patient with my mum. Thansk also to Dr. Silke Vogelgesang (pathologist), Dr. Schröder (endocrinologist), Dr. Kuse (anaesthesist). Our thanks also go to all those I have not mentioned by name but whose invaluable work has contributed to my recovery. It was your teamwork that allows me to be healthy today! Many thanks to the Magdeburg team (Professor Mohnike, Ms Empting and all those who cared for us! And thanks to Dr. Ludwig von Rohden for his much-appreciated work and expertise. We also owe a debt of gratitude to Dr. Traugott Eberhard. If you hadn’t analysed the scans so carefully, the operation would never have been possible. It was only your trained eye that made an accurate diagnosis possible. Our thanks also go to Professor Thomas Berger of Luzern children’s hospital, who gave us perfect medical assistance and who suspected hyperinsulinism very early on. You took appropriate action to prevent secondary damage. Many thanks to Professor Eugen Schoenle of Zurich children’s hospital (endocrinology) who accompanied us for 18 months and who was confident early on that my parents had the skills needed to take good care of me (using the insulin pump, sandostatine). Thanks to Professor Eugen Schoenle we were able to get a second opinion in Magdeburg and to have the operation performed in Greifswald. Thanks for sending us to the right address in Germany! Thank you, Professor Barthlen, for your help! In the meantime you have helped other children who were diagnosed with diffuse hyperinsulinism but then turned out to have the mosaic form. I recommend obtaining a second opinion from Professor Barthlen in Greifswald and Professor Mohnike in Magdeburg. I would move heaven and earth for my child! Help, questions for my Mum! My Mum is still actively involved and interested in issues concerning hyperinsulinism – the past eighteen months have left their mark on our family. If you have any questions, don’t hesitate to contact us via PN. I’m doing very well. I talk, play, run, climb, quarrel, ride my little car and plastic motorbike; basically, I do everything a toddler does at my age. I eat as much as I like, or at times I don’t eat anything at all. I love to nibble chocolate. My whole family is grateful every day for the operation that cured me. The only thing that reminds us of what we went through during the first eighteen months of life is the scar, which now looks quite nice, actually.